Why is it so hard to live up to our pedagogies? The concept of “engagement” — a couple of you used that term, and it’s a very timely concept. A good way to think about engagement: the degree of attention, curiosity, interest, optimism, and passion that instructors can inspire and that students can reveal. Audiences for student writing: if you want to encourage students to think about writing for someone other than the teacher — other students, say, or legislators, or local government officials, or business associates — you can encourage that in longer projects where the audience can be flexible. This wouldn’t work with many of your shorter scaffolding projects but can for longer ones. Assignment Design: how much or how little do you want to situate and contextualize the assignment for students via headnotes? Effective learning strategies were more frequently used by students who were older, enrolled part-time, or taking all their coursework online, and were associated with higher self-reported college grades. Students taking all of their courses online were significantly less engaged in collaborative learning. Females report significantly greater use of learning strategies than males. Learning strategies were also used more frequently by nontraditional college students. 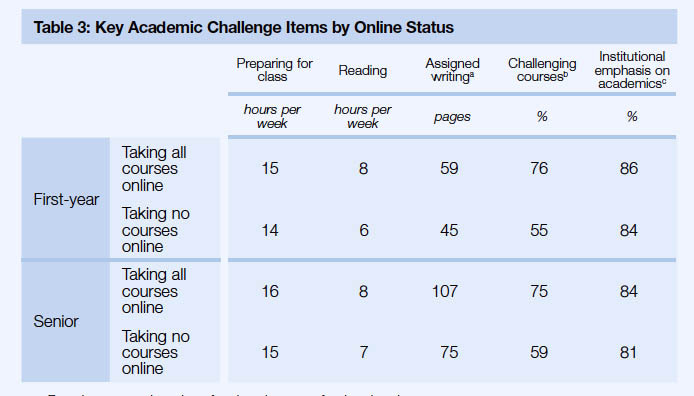 Students who were older or taking all their coursework online used study strategies more often than their counterparts. Additionally, first-generation students, transfer students, and students not living on campus used learning strategies more often than their counterparts (p.12). Online institutions may find encouraging results in NSSE 2013; both first-year students and seniors who were taking all of their courses online rated the quality of their interactions higher than those of their campus-based counterparts (p.18). Inform the students of the pedagogy and the idea behind it. Students need to be aware that the decisions that go into a course are not arbitrary, particularly when the procedures seem so radically different from other large blended classes. While some may ultimately still desire authoritarian instruction, once engaged, skeptics might eventually come around; students informed of feminist pedagogy may start to question their assumptions of the relationship between instructors and students and develop critical thinking and lifelong learning skills, patterns, and awarenesses that go beyond the actual course. Break down the hierarchy of class physically and intellectually. Using technology to support multiple interpretations, encouraging collaborative learning, allowing students to contribute to the process or content, or encouraging students to be responsible for their own learning is not necessarily obvious. That does not mean you cannot make technology serve your needs. While you will need to facilitate this nonhierarchical mode to support students, you might be surprised to learn from them new ways of using technology in the classroom. A feminist approach requires such questioning of assumptions about teaching practices and goals. Students’ voices can be incorporated even in large classes with a little effort and the use of technology. There can be spaces for individuality and personal perspectives even in a huge blended class with a sea of faces or long list of names online. Technology, when used improperly, can isolate, whereas critical and thoughtful engagement can lead to student connections and a dynamic educational community. Make technology work for you, not the other way around. Technology has a way of asserting dominance over our classroom environments when we are not aware, so be mindful of design biases. Think about your class goals and what you want students to do or be able to complete. What are you trying to accomplish with each technology — to give students a voice, encourage Pedagogy Published by Duke University Press 506 Pedagogy collaboration, allow alternative interpretations of the text? Does this technology support your goals, or does technology constrain? Make conscious efforts to push the boundaries of what is possible, but always test these technologies beforehand, to be more informed about the unintended consequences. We found that sometimes working with technology can be a hassle, but sometimes it is worth the hassle if it maintains the pedagogy. Know this up front, and allot time for it (and ask for help). Don’t take on technology and/or large lecture classes alone — use all the resources at your disposal. If we have learned nothing else, it is that teaching a large blended class using feminist pedagogy with so many challenges should not be done alone. Teaching like this should always be a community process. While not all teachers will have the same level of support or resources on their campus, all should at the least avail themselves of the software and hardware companies’ technical support. Additionally, many online forums, blogs, listservs, or other resources for teachers are sponsored by vendors and professional organizations. Social media platforms such as Twitter can also serve as access to resources and connections to other educators. Ask yourself who is on campus to support you — and not only official technology or teaching support. Talk to colleagues engaged in postpositivist pedagogies. Communicate your vision to the people around you and open the class up; invite the supporting people to come to the face-to-face class, to log in to the online class, to get the full context of what is going on. It took all of us to make this class work in a feminist way: collaboration between Cecilia the instructor, knowing the content and managing the classroom; Kathryn the teaching assistant, facilitating face-to-face and online communication; Aimee the instructional designer, supporting the selection of technology and design of the online portion; as well as others in an educational community with a common vision. Breaking down hierarchies by valuing others’ voices and experience, including those of students, makes all feel like legitimate members of the class, more invested in making it work, and proud of its successes. Writing teachers who teach writing online — or who want to teach online — often confront new and multiple pedagogical, technological, and disciplinary contexts, opportunities, and challenges. We will explore and write in those contexts with a variety of technological platforms and genres so that you will leave this class with a project that demonstrates your proficiency and excellence in teaching and assessing writing online, focusing on your resourcefulness and flexibility in using contemporary writing technologies. Just as writing instruction that takes place in face-to-face environments is informed by social, cultural, political, and economic forces, we also attend to those forces in our planning and discussions so that we might remain attentive to — and mindful of — the needs of inclusive learning environments and diverse student populations. No teaching experience is required or assumed in this course, and no extensive experience with writing technologies is required. Note that this is a hybrid course: we meet in person every other week during scheduled course sessions and then online every other week. One-half of our course will be conducted in person and one-half — every other week — online, in a hybrid format. Our online work will be done in DePaul’s online course-management system, D2L, in addition to writing technologies that we want to try in support of our work together. Hybrid and online courses require good time management, pro-active problem solving, and resourcefulness — all good qualities to have anyway, both in college and in life — so we will be practicing those qualities as part of the course. Since good writing instruction is good writing instruction no matter the mode of delivery — face-to-face, online, hybrid — we spend the first couple of weeks deciding together what constitutes “good” writing instruction, and then tracking those features in our work and class projects.